THERBAL–Heat balance and equilibrium calculation program. THERBAL is a spreadsheet-based equilibrium calculation program. It uses the FREED database, plus specialized databases derived from FREED. 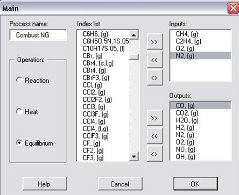 THERBAL allows repetitive calculations at variable temperature, pressure, and variable input of a substance. A built-in charting feature can generate a scatterplot of results. It also has a target feature that will seek the value of an input species to attain a closed heat balance. The equilibrium species are expresssed as amount, mol fraction, and mass, and DG° for all species. The activity is also expressed for unstable condensed phase species . THERBAL allows the use of non-ideal solutions, as expressed in various conventions, or as empirical equations. A one-year license for THERBAL is available for $20 ($10 for students who rely on a professor for instructional help). Purchase of THERBAL includes a free copy of FREED.